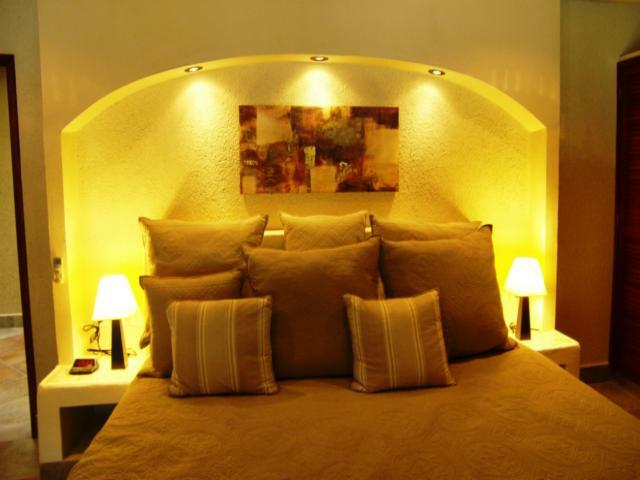 Casa La Via is currently offering a 25% discount on posted rates!! Located in the new Sirenis Resort development, Villa La Via is a recently completed, 3400 square foot, exclusive and very private villa. Sirenis is a residential neighborhood which is part of a hotel resort area on the beach, just two miles north of Akumal and one of the most exciting new areas to be developed in the Riviera Maya. 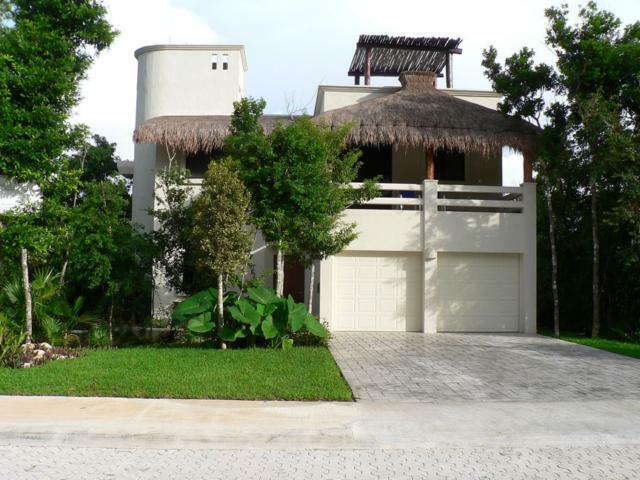 Casa La Via is 5 mins from Akumal, 20 mins to Tulum, 15 minutes from Puerto Aventuras and 30 mins to Playa del Carmen, by car! 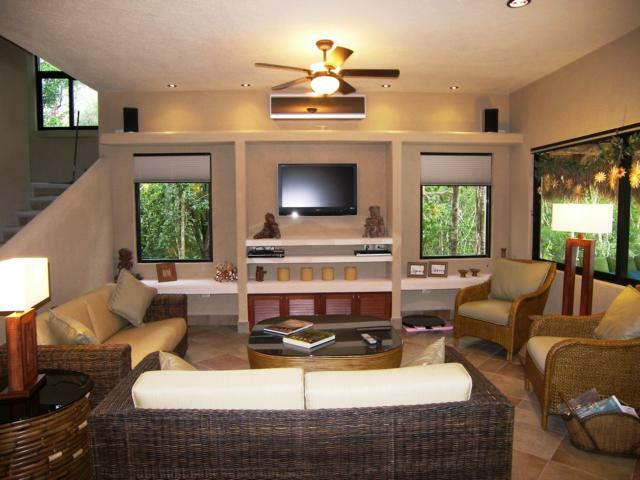 Casa La Via is a modern home decorated in a Mexican Hacienda style and combining natural stone and wood materials. Mayan art in the form of ceramic figurines and statues adorn the walls and furniture, giving it a taste of local history. This spectacular 5 bedroom, 3 ½ bathroom home is nestled in a completely natural, quiet and serene jungle setting, only a 10 minute walk from the beach. The front entrance of the villa leads onto a large open planned living area. 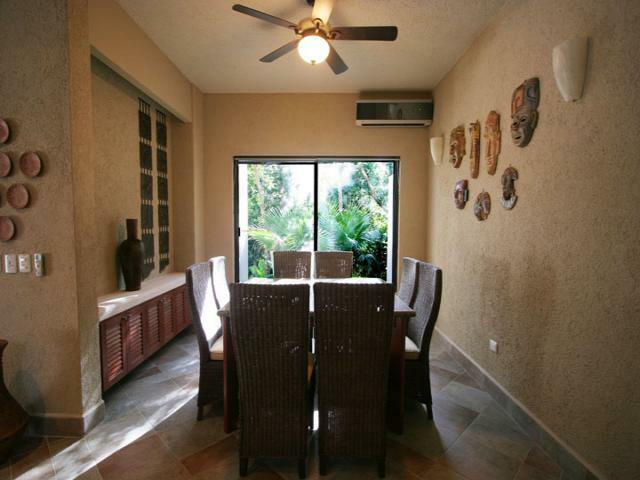 A formal dining area is located in a nook on the right and seats 8 in elegant wicker furniture. To the left you’ll find the cozy living room, with plenty of comfortable sofas and chairs facing a large flat screen TV. Across from the spacious living area is a fully-equipped kitchen complete with stainless steel appliances. 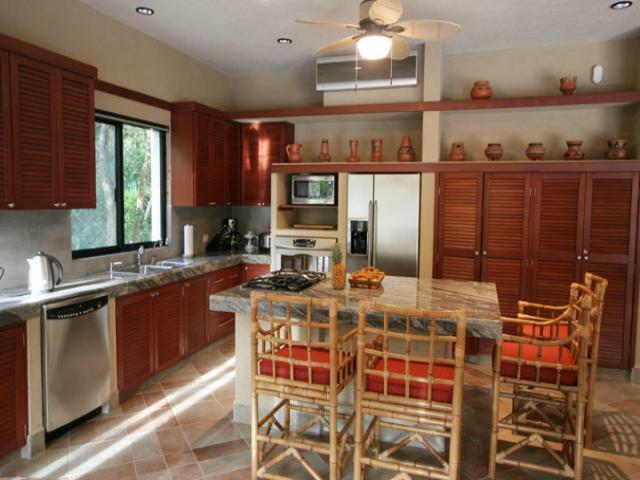 The kitchen also features a large rectangular granite countertop breakfast bar with 4 stools as well as a bamboo dining table which can seat a further 6 guests. The spacious first floor interior gives onto a large poolside veranda which offers further seating for 12 guests. The pool deck is raised above a landscaped tropical garden and allows guests to take in the fabulous jungle views, whether from a sun lounger, a hammock or one of the 2 bars built in the pool. 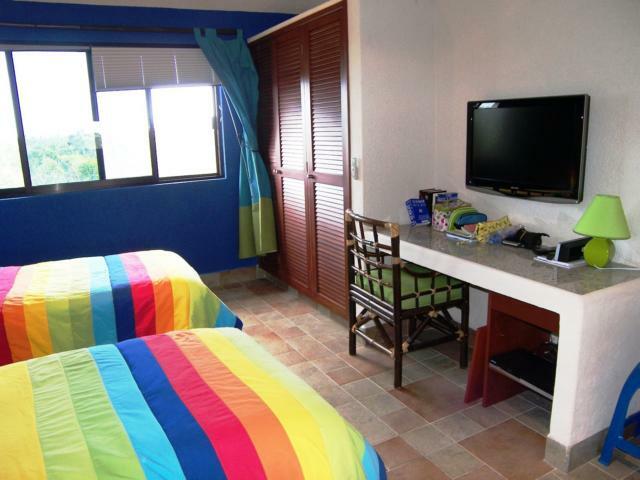 The bedrooms are all on the second floor and are fully air-conditioned. The first bedroom is an exercise room including an exercise bike. It doubles up as a small guest bedroom with a queen sofa bed. The second bedroom has a king sized bed, a dressing table, a flat screen TV and a private balcony, and its own bathroom. 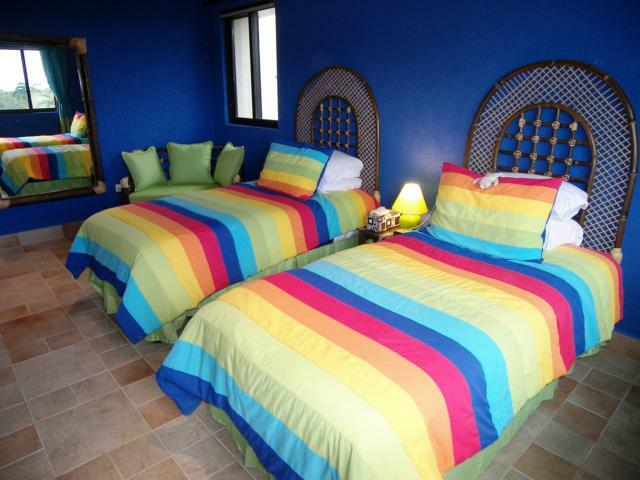 The third bedroom is perfect for the kids and offers 2 bunk beds, with 4 twin size mattresses. The fourth bedroom is the Master bedroom with a king sized bed, 2 dressing tables, a flat screen TV, a half moon shaped balcony overlooking the pool and jungle and a large bathroom with a tub and separate stand up shower. The fifth bedroom is a large room with 2 queen beds, dressing table and flat screen TV. The first, third and fifth bedroom share a large bathroom located on the second floor landing and all bedrooms have ample closet space. Casa La Via is only minutes away from a secluded boogie-boarding beach and guests have access to the beautiful Yalkulito Lagoon. 2 beach umbrellas, a cooler and 3 boogie boards are provided for the trips down to the beach. The villa also has a partially shaded rooftop terrace with ocean views during the day and a lounge area for stargazing at night. 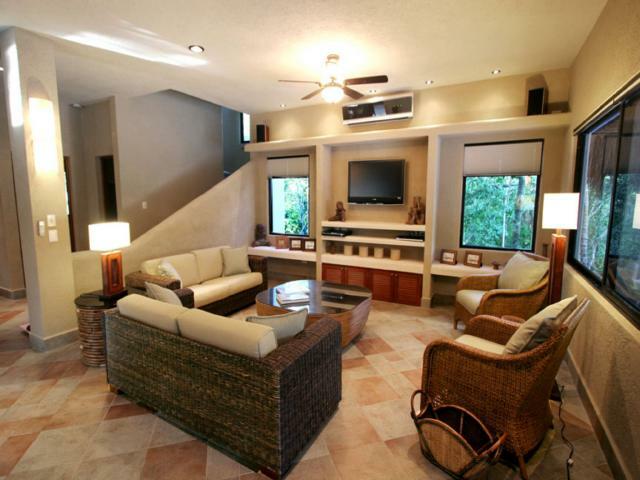 Casa La Via is a truly exceptional hideaway – the perfect family vacation home! An evening dinner/disco pass can also be purchased and includes dinner at the buffet as well as the disco until 2:00 am with all drinks included. Guests of Casa La Via now enjoy a 10% discount on the luxurious spa services â�� a day pass is not required. The guest pays only for the spa services. Note:To reserve a spa treatment, the guest can call the Spa Manager, Mrs. Montserrat Martorell, at 984-875-1700 ext 5430/5432. She speaks English. IMPORTANT: Heated Pool at USD $300/week. 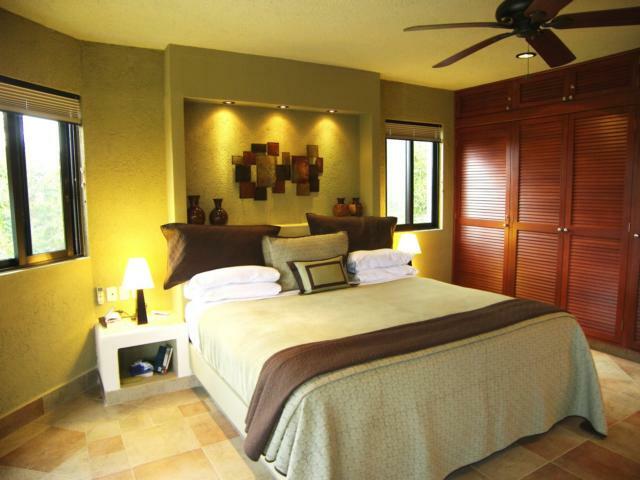 Currently Casa La Via is offering a 25% discount on posted rates!!! $1000usd security deposit and $1000usd security deposit for the use of the golf cart! ***IMPORTANT: Heated Pool at USD $300/week. 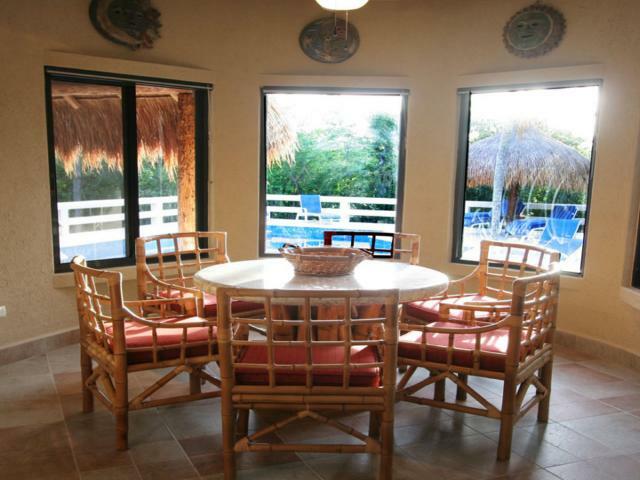 Our large family chose Casa La Via and loved it. 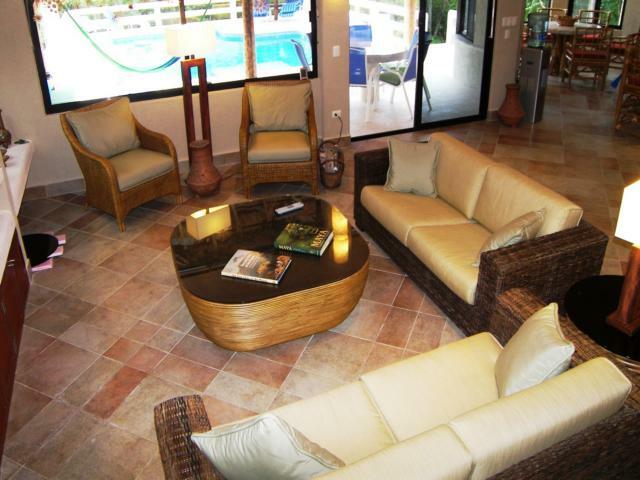 The villa is outstanding and the owners have equipped it with everything you could possibly need. The personal touches were very much appreciated. It is a beautiful and spacious home and while the photos show you exactly what you get, they cannot fully depict how wonderful it is. The pool and patio/deck were our favorite place to spend time, although family dinners around the large dining table were pretty special too. We used the snorkeling equipment at the nearby lagoon for some private snorkeling (not like the hoards at Akumal) and were happy to have the bikes and golf cart for use in the community as well. We didn't rent a vehicle, but taxis were easy to obtain so we could visit beaches or attractions that are close by. Also, lots of tours include transportation. Victor, the groundskeeper, kindly drove us to the main gate in the golf cart when required. The owners have created a binder of information on everything from using equipment in the villa to the best beaches, attractions and restaurants to visit. It is very comprehensive and a valuable tool to use during your stay. While we didn't deal directly with the owners, the rental agency was excellent to work with and answered all questions within a day and often the same day. We would recommend Lol Ha restaurant in Akumal, the Coba Maya Encounter, Tulum (early in the morning) and sailing through Akumal Dive Shop. Wilma and Victor were so friendly and kept the villa and grounds immaculate. We had Wilma cook us a meal one evening and it was great. Loved the Lime soup! We have already recommended La Via to friends. 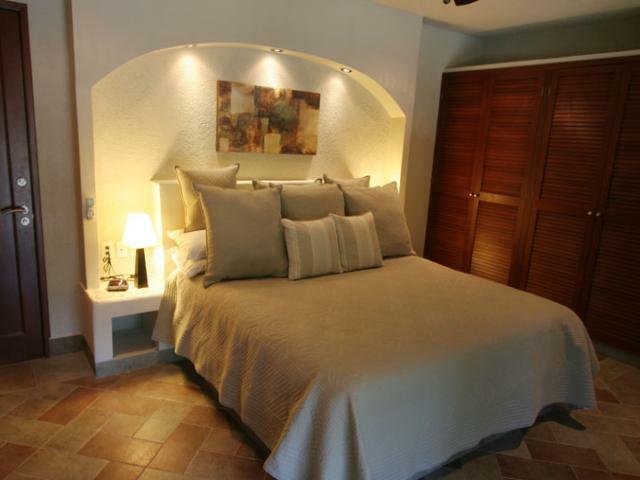 This is our third stay at Casa La Vi­a and we just love it! There are still so many things to see and do. It is so well located that we were on the main highway within a minute and close to absolutely everything! We all loved zip-lining and snorkeling at Hidden Worlds and boogie boarding at Tulum with the best oven pizzas at La Vita e Bella. Our 3 teenagers had no time to get bored! The cenotes were a big hit. Dos Ojos was acclaimed the favorite (and we visited many)! Swimming with the turtles in Akumal Beach was breathtaking these huge turtles are so majestic! The villa itself is wonderful. It has everything one would imagine in a dream home! It is very well appointed and you can see the quality and thought that went into its design. We had lots of space to spread out and with all the terraces, you could always find a quiet corner to yourself. 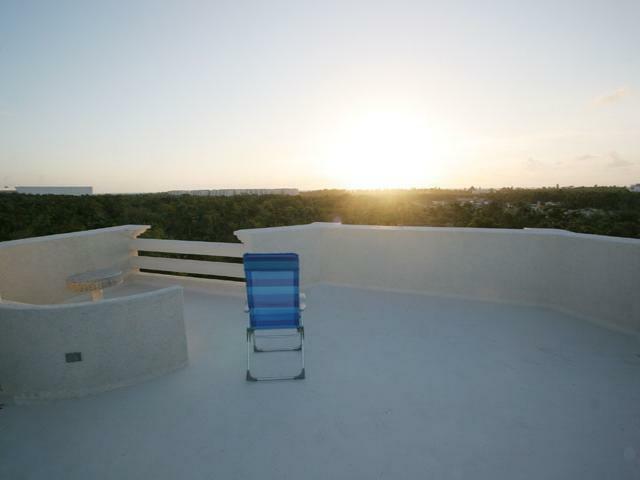 The rooftop terrace was one of our favorite get-away-from-it all spots be it for watching the sunrise over the ocean with a good cup of coffee or enjoying a Margarita while catching the last rays as the sunset over the jungle. At night when our kids would watch a movie (the movie selection was superb), we would head up to the terrace and stargaze! What a perfect way to end our day!!! Your house is absolutely beautiful! The kitchen is incredibly well thought out and stocked. It is the best equipped kitchen that we have ever stayed at. I commend you. We really absolutely loved staying here and found that everything went really smoothly. The snorkeling gear and boogie boards were a fantastic addition. Both Wilma and Victor were so friendly. They really kept everything so spotless. Wilma is a great cook and I can still taste her tortilla soup! I would wholeheartedly recommend your villa and it is well equipped for children. The swim-bed in the pool made a superb wading pool for our little ones. And they just loved the cool bunk beds! There is also so much to do in this area that we could have been kept busy for a month. We can't wait to come back! Casa La Vi­a is real gem! It is decorated with such taste that we felt as if we were in a 5 star hotel, yet had a villa all to ourselves! We felt right at home as soon as we walked through the door. The beds were amazingly comfortable and we really appreciated being able to control the a/c throughout the whole villa, not just the bedrooms! The villa is spotless and everything from the towels to the kitchen utensils and glasses is top-notch. Being on the grounds of the Sirenis Complex was such a treat! We actually snorkeled without a soul around at Yalkuito Lagoon. We just left our towels on the shore, hopped in and snorkeled around this little lagoon edged by the jungle. We saw some pretty amazing fish and could not believe that we had this private lagoon to ourselves! We also tried out the spa at the Grand Sirenis at the end of the afternoon one day , wow, was it ever luxurious!! And you did not need a day pass, we simply paid for the treatments! The hot stone massage was incredible! We always felt extremely safe. The highway is well-patrolled (we made sure to watch our speed) and the villa is part of the Sirenis Complex, so there is a guard at the gate and the area is patrolled all day and night. The people in this area of Mexico are so warm and friendly. We will definitely be back! A wonderful week in paradise with the family. 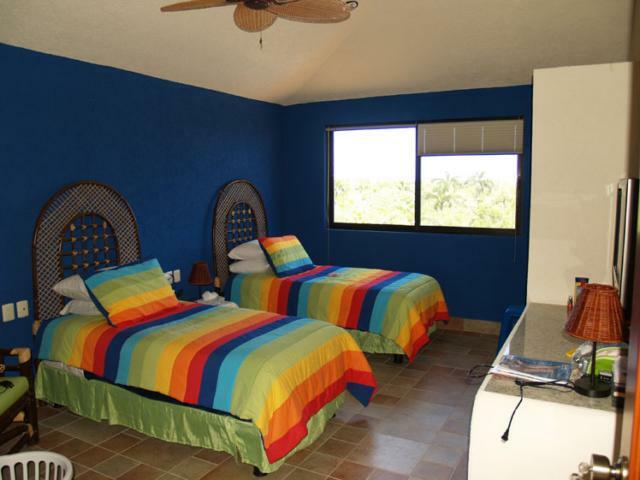 We have stayed in the Akumal area before but this was our first time at Casa La Via. It certainly won't be our last!! The pictures on the Internet, although very nice, do not do this villa justice! It is even more breathtaking than we expected. The little decorating touches throughout have been done with such taste just like in a magazine, yet also very comfortable so you don't feel as if you are going to break anything. The jungle views were spectacular -- so lush, green and private. This villa was the perfect place for our day trips. 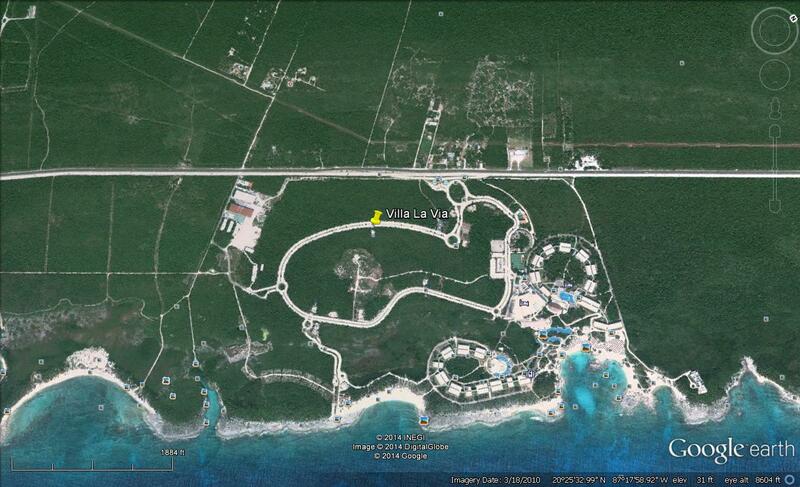 Within minutes, we were at a cenote, Xpu-Ha Beach or Akumal. The kids loved jumping in off the cliff at Cenote Azul on our way back from Xpu-Ha Beach. We appreciated having all the beach chairs, umbrellas and coolers provided. We would pack up the car and head off to explore! The Welcome Book provided all kinds of hints and suggestions for beaches, restaurants, and day trips. It was so practical and complete that we got to see so many things that we did not know about on our previous trip to Akumal. We had a touring and beach vacation, all in one, which was fabulous! The staff was very friendly. Wilma makes the best guacamole and fajitas!! She kept the villa spotless and always had a big smile for us. Santiago was very helpful and the pool was always in perfect condition for us to enjoy! We can't wait to come back!! 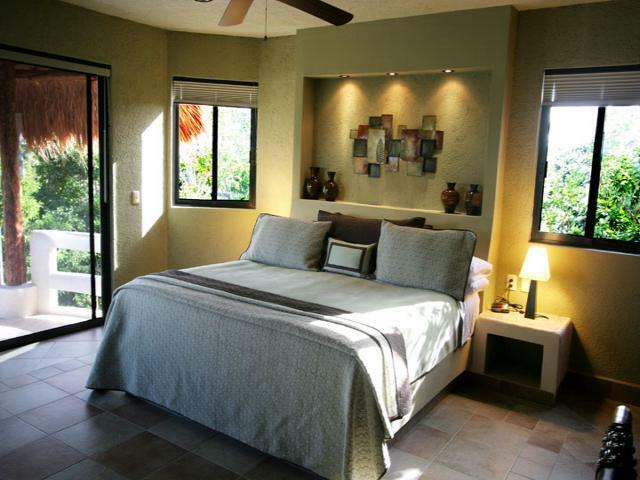 Casa La Via is absolutely charming and a place of utter relaxation! We really enjoyed the peacefulness and seclusion of the jungle. It was a nice relief from the sand and wind of the beach. The kids just loved the cute geckos... they were drawing them all week! They kept looking for the pair of monkeys that apparently live nearby, but had no luck this time. The pool area was fabulous. My husband the sun-worshipper, loved the built-in sun bed while I could not believe that we had our very own palapa by the pool! The pool bars were just fabulous for our Happy Hour margaritas! The villa itself has everything one could wish for. It is so tastefully decorated in a Mayan decor and extremely well thought out and everything last little thing you need is there! From the detailed Welcome Book, a guide book in itself, to the kitchen that has every last little pot and cooking utensil you may ever need, we never felt that we were missing a thing! Wilma always greeted us with a big smile and kept the place immaculate. Santiago always had a cheery hola for us and kept the pool sparkling and so inviting! We are already planning our next trip!